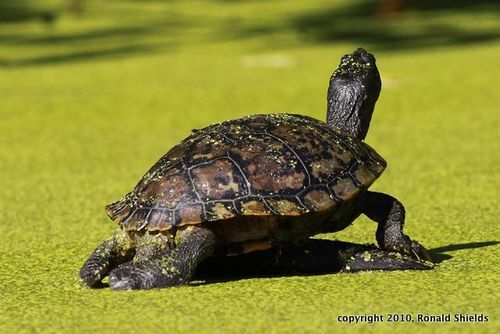 Ron Shields sent in an additional Tuesday Teaser photo, along with the comment that the turtle was the size of a dinner plate. That prompted NJMC Naturalist Brett Bragin to say: "If that turtle was the size of a dinner plate, it must have been a slider (not native to N.J.)"
To give you an idea of what you might see in the Meadowlands in the coming month, we thought we'd post a sample of the highlights from October 2009. On the Marsh Discovery Trail we had Osprey w/fish, soaring Redtail, a few peeps, many yellowlegs, egrets, No. Shovelers and Gadwall. In the butterfly dept., we had Monarch, Orange Sulphur, Cabbage White, and a very bedraggled Common Buckeye. Save the date: Monday, Dec. 6. 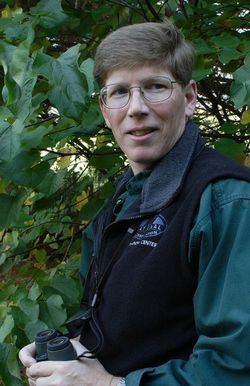 That's when prize-winning nature author Scott Weidensaul will give a free talk, “Against All Odds – Miracles of Bird Migration,” in DeKorte Park, Lyndhurst. 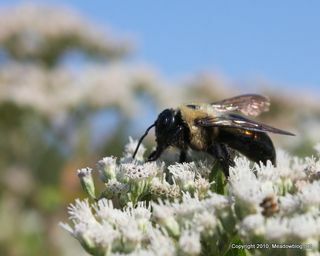 The talk, hosted by N.J. MC and sponsored by the Bergen County Audubon Society, will take place at 7:30 p.m. in the Meadowlands Environment Center auditorium. 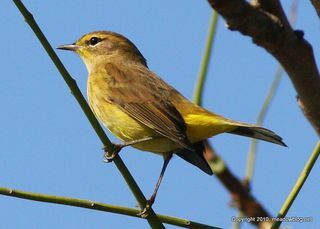 Weidensaul is the author of more than two dozen books on natural history, including the Pulitzer Prize-nominated “Living on the Wind,” about bird migration. His talk will explore the wonder and mechanics of migration, and the simple ways that humans can help at a time when the populations of many migratory birds are in drastic decline. 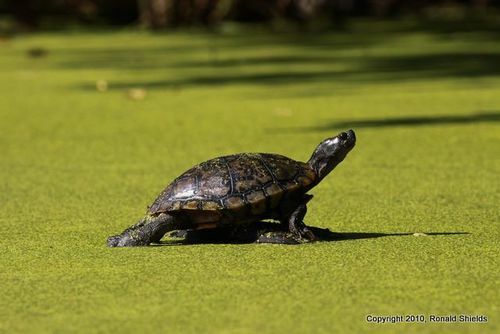 Ron Shields photographed this Tuesday Turtle Teaser recently in the Kearny Marsh, and wants to know what kind of turtle it is…. 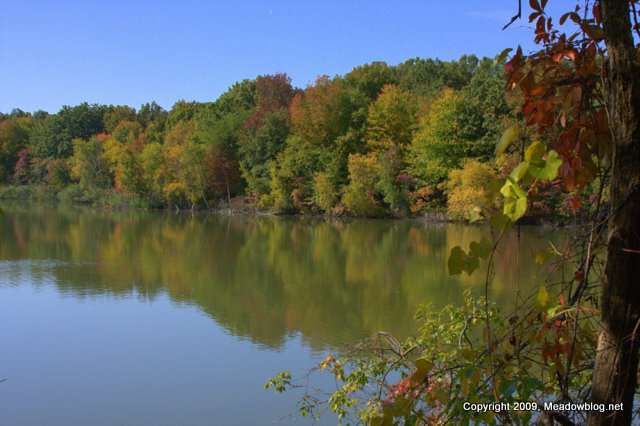 Next Nature Walk is This Sunday! 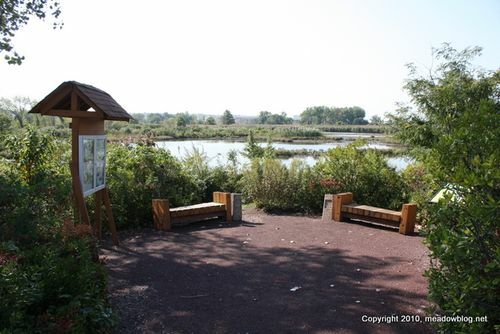 Our next nature walk is Sunday, Oct. 3, at 10 a.m., and the place is Laurel Hill County Park, next to the Hackensack River in Secaucus. It's a bit off the beaten track, but a cool place to visit this time of year. 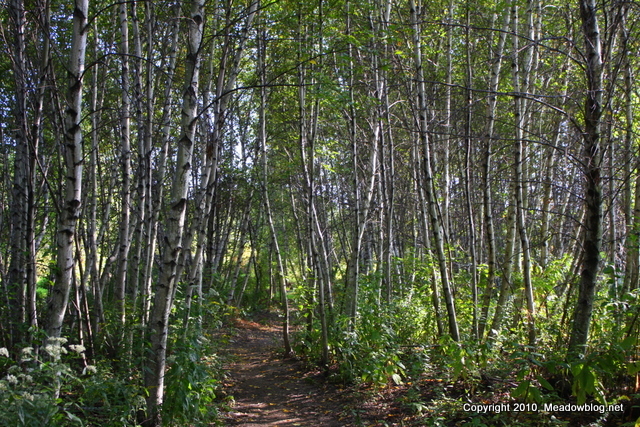 If you walk into the park far enough, well past where the teenagers clearly hang out, you'll encounter some striking scenes — like this stand of birches, or the bee nectaring here. 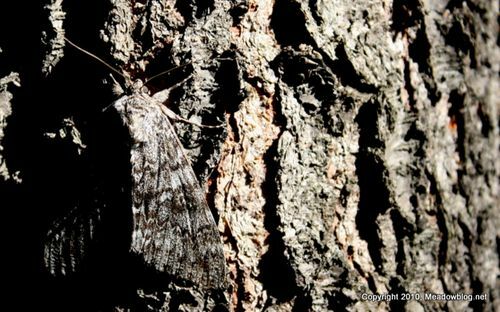 Or the amazing camouflaged moth below. Lots of dragonflies and migrating Monarchs as well. 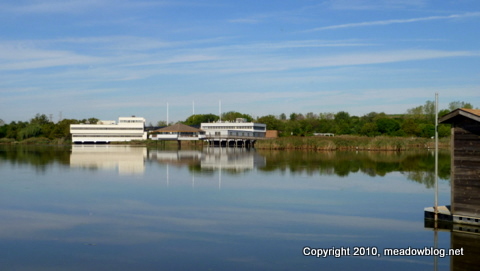 Mike Gempp reports seeing an American Bittern and the Whimbrel on the final NJMC pontoon boat tour of the season yesterday evening. 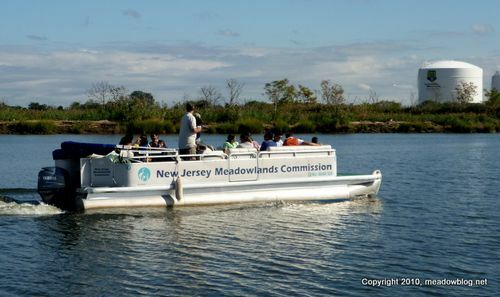 The Meadowlands Commission would like to thank everyone who joined us for one of our two-hour cruises on the Hackensack River and into its adjacent marshes in 2010. 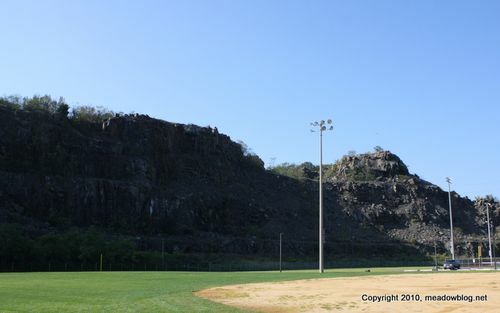 We hope to see you again next spring. According to Mike, here's the word on the bittern, plus other highlights: "As you enter the Mill Creek Marsh on pontoon boat from Mill Creek Point, you go past an old colonial tide gate just as you enter the marsh proper. The Bittern was in the Spartina on the North side just as you round that first corner. "We got two good long looks at it. First we saw it flying into cover. 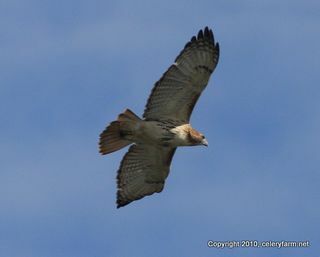 Then, when we got closer, it flew off into the distance, giving everyone a good look at the unusual wing pattern. 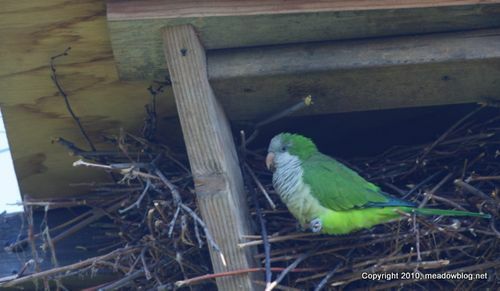 The 16-acre Skeetkill Creek Marsh in Ridgefield is a small oasis in an otherwise commercial section of town and a great place to chill on weekends, just down Railroad Avenue a few blocks from the Monk Parakeets (see post below). Earlier this week we saw migrating Monarchs galore, a Palm warbler, yellowlegs and peeps, Green-winged Teal, Snowy and Great Egrets, and a Northern Harrier scaring the feathers off a bunch of local starlings. Directions to the marsh are in the left-hand column. The Monk Parakeets of Ridgefield were doing fine when we checked earlier this week. They are not only living in their old nests under the causeway, above the railroad tracks, but a few are also hanging out in the nest boxes (above) built last spring when the bridge was repaired. They live in the nests year-round. We figure there are at least 30 in this colony. Previous posts on the parakeets are here. Directions to the parakeets are in the left-hand column. The birds themselves are easy to find. Just listen for the squawking.